A luxury car with a chauffeur service is an excellent combo of class, style, and dignity. Chauffeurs are persons employed to drive a luxury vehicle such as a limousine, BMW, or any other luxury cars. Chauffeur services in Dubai are mainly used for corporate car rental services, Airport car rental services, holiday car rental services and Wedding car rental services. Unlike the normal cab drivers, Airport chauffeur service in Dubai has professional and well-trained drivers and their services are not just limited to driving. They are ready to serve their clients. Airport chauffeurs service in Dubai makes sure that you are safe. That is the first priority of the chauffeurs. 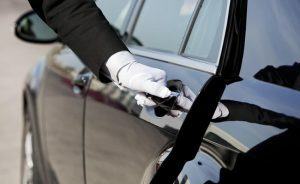 The security standards provided by chauffeurs to its customers is high. They make sure that you are fine till they safely reach you to your destination. They are well-trained chauffeurs and they know how to handle a situation if an emergency came. Airport chauffeur services provide you the ease and comfort while traveling. They provide you with the most comfortable travel experience. Chauffeurs have good knowledge about the places and they will make sure that you have a comfortable stay and journey. Are you worried about reaching your destination on time? No need to worry when you are with the best airport chauffeur services in Dubai. Airport chauffeur will reach your destination on correct time. The chauffeur has exceptional knowledge about the routes and they will reach your destination without any hassle. Airport chauffeur service in Dubai provides exceptional security services for its travelers. Be it a VIP or businessman, airport chauffeur service in Dubai provides you with maximum security and safely do the airport transfer services. A good airport chauffeur service in Dubai helps you to save your valuable time. You don’t need to wait in the long queue of airport taxi for traveling. The chauffeur will take care of everything. Moreover, you can do office work on the way. The spacious luxury car provides you the comfort of conducting small meetings with your clients inside the car as well as the luxury of doing your job. You will experience the best travel experience with the luxury car rental services. Airport chauffeur service in Dubai provide you with the privacy of doing your job. You can do your work without anyone disturbing you. Unlike the cab drivers, you will experience the experience and professionalism of chauffeurs in their appearances and with their services. Chauffeurs are trained professionals, well-mannered and smart. They provide you with a smooth and safe travel experience. Airport chauffeur services in Dubai provides you with flexible services to its clients. They can adjust their timings according to the flight schedule. No need to worry if your flight got delayed or came early, chauffeurs will be at your service from the moment your flight reaches. Thus, Airport chauffeur services in Dubai provide professional and exceptional services to the customers. Hire Limo in UAE for best airport chauffeur services in UAE.